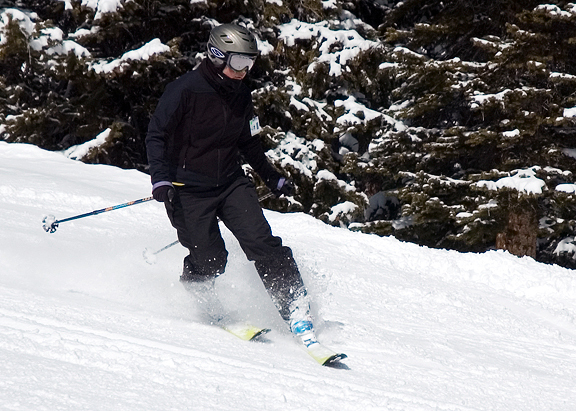 Happiness is getting another day of skiing when you thought your season might be over. We hit the local hill this morning and played around working on form, balance, technique. Another gorgeous bluebird day! A couple of weeks ago I made a bunch of cookies to send to my MIL’s quilting groups to thank them for the awesome ice cream cone quilt they made for me. With memories of those incredible melt-in-your-mouth cookies that Anita had sent to me from Miette, I searched for a cream cheese cookie recipe in an attempt to reproduce that kind of joy. I found a recipe in one of my old cookie books that looked pretty similar. The book suggests using full-fat cream cheese to maximize the tenderness of the cookie. Because the dough needs to be refrigerated, this isn’t one of those recipes that lends itself to last-minute rush jobs. The dough is pretty well-behaved and rolls out easily without too much sticking. 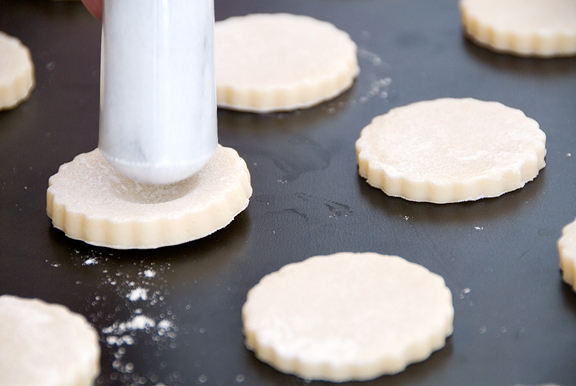 Sticking is annoying because it will shear the cookie dough if you have to pull it from the work surface, resulting in an ellipse instead of a circle. I’m not ellipse-ist, but my general preference is for circles in this instance. I used a little marble pestle for the indentations because my thumb isn’t symmetric. Take care not to press indentations too enthusiastically. I pushed a few too far and wound up with leaking jam. The recipe calls for a honey-nut filling, but I was having none of that. I wanted raspberry jam – just like the cookies Anita had sent. Stupidly, I had purchased a jar of raspberry preserves… seeds and all. Don’t do this unless you like seeds in your cookies. Running that jar of preserves through a fine mesh sieve is a good way to make yourself insane. One problem I encountered with my cookies was that I probably didn’t cook them long enough. The dough was fine, but the jam took a long time to set if it did at all. I suspect a few more minutes could have solved that issue. Everyone who received these cookies in the post probably had some nightmarish sticky mess to deal with. At least the reports came back that they were delicious, mess or no. Edit: I forgot to give my verdict… The cookies were nice and soft with a mild and sweet tang to the dough from the cream cheese. The jam is a perfect pairing with it. However, they aren’t quite the delicate and magical cookies that Miette cranks out. So be it – all the more reason to make a pilgrimage to San Francisco to visit that shop! Meanwhile, this recipe is a keeper. In a medium bowl, combine flour, baking powder and salt; set aside. In a large mixing bowl, beat butter, cream cheese, sugar, and vanilla together until light and fluffy. Mix in flour 1/2 cup at a time, blending well. Cover and refrigerate overnight. Preheat oven to 350°F. Divide dough in half, leaving one half in the refrigerator. On a floured surface, roll the dough out to about 3/8 inch thickness. Cut out dough with cookie cutter (I used 2-inch round). Gather and re-roll the scraps. Repeat with second half of dough. Place rounds on ungreased cookie sheet 1 inch apart. 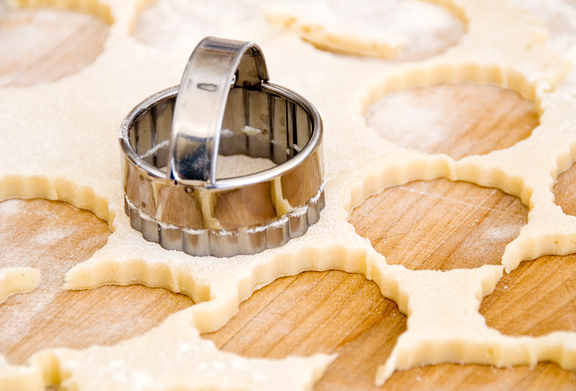 Use thumb or other utensil to press a 1-inch wide indentation in the center of each circle. 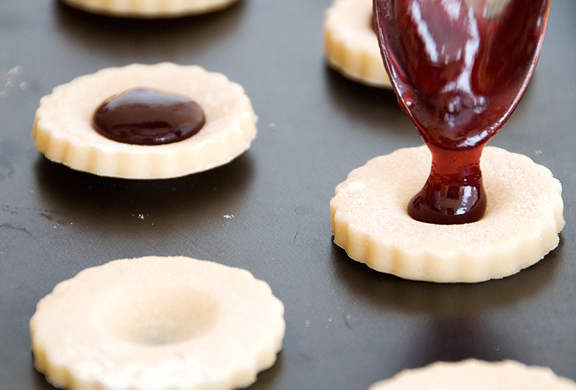 Fill divots with a teaspoon or more of jam, taking care not to overfill. Bake 13-15 minutes or until pale golden brown on the bottom. Cool on racks. Store in an airtight container at room temperature for 1 week or freeze for longer storage. Oboy! That picture where the cream cheese is getting (uh) creamed is what you’ll find in the dictionary next to “money shot” :) How do you think these compare to the Miette cookies? Was the taste even close? Whoohoo hot couple! Watch that powder! Go tele! I am using these terms wrong! Yay for one more day on the slopes! And yay for these beautiful cookies! Oh these look just perfect. Cream cheese. Cookies. Most definitely perfect! My biggest mistake was reading this post first thing in the morning, now I will probably spend the rest of the day thinking about these. I think jam and ccokies are one of those combinations made in heaven. Can’t wait to try these! 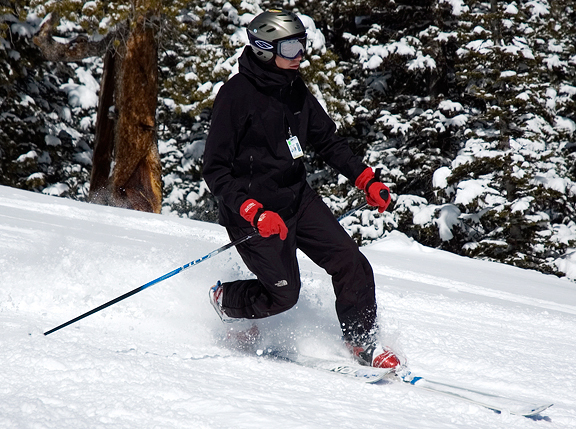 It’s good you got in one more day on the slopes. Where as I can’t wait for this horrilble snow to melt so the Spring can start and I can get out on that lake and go fishing. I gotta stop reading your Blog first thing in the morning, cause I see this food that you post and then I have horrible cravings all day! right now I really want a cookie! Those look delicious…something I am going to try soon! Very stream-lined, no nonsense cookies…butter and raspberry…that’s it, that’s best! Oh how cute! Perfect cookie for spring! and of course, very pretty cookies! i’ve been thinking about doing some lime thumprints this weekend, will use the pestle idea! Those cookies look really good. I guess I’ll have to use some of the seedless raspberry preserves I got to make Dories perfect party cake and make these tonight. Oh, just so you know, I shamelessly stole your “raspberries as decoration” idea for that cake as I’m not very handy with a piping bag. :) Thanks for the inspiration! My goal is to someday produce a cake that looks as good as yours did. Raspberry jam and cream cheese all rolled up into a cookie sounds really good! Ok, we’re really happy that you guys are getting more snow, really we are. Peace here, our friends and may you continue to have snow for as long as you want. Dam, his tele moves looks awesome!! Can you guys teach us how to do that? We like cookies that are nice and soft, just like these. Love the cream cheese addition. We’ll try out these cookies, for sure! What a great recipe and the cookies are beautiful. I am always looking for something new and special to send in a care package – last year was homemade Magnolia cupcakes. I am going to have to try out this recipe this year. I always say that I wouldn’t mind the snow if I lived in Colorado. Of course, I don’t really know if that’s the case, but that’s what I say! I am reading past posts you’ve made and I came across the sizzling rice post. A) Hunan’s Restaurant was where I fell in love with sizzling rice as a kid. Every time my family and I went there I ordered sizzling rice soup. B) I have the exact bag of sizzling rice cakes in my pantry! Jen – the things you make, whether simple or fancy – are always mouth watering. 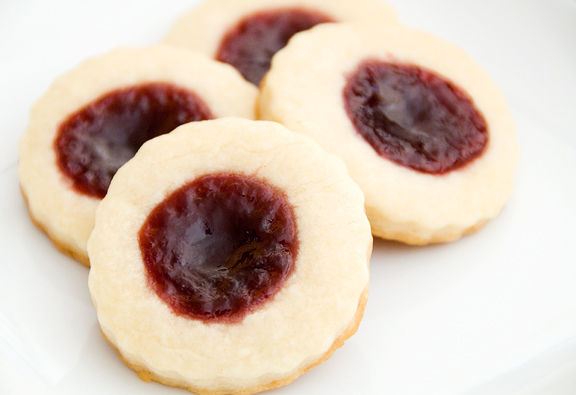 These remind me of jam thumbprint cookies that I like. 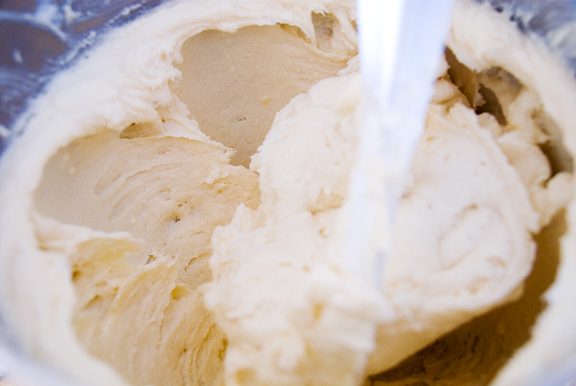 Cream cheese is a rich but oh-so-good addition to cookie dough or pastry dough, I think. Zingerman’s here in Ann Arbor makes one of their pie crusts with cream cheese and it’s freakin’ delicious. And thanks for the seedless jam tip – good to know! I have never made cookies like these. They look superb! hey Jen, I’ve presented you with an award on my blog! Also, those cookies look delectable! Cream-cheese-anything sweet is wonderful to me. Never thought of making a cream cheese cookie, and I fear I would eat dozens and dozens. Btw, Jen – As part of my course, I’m required to write about my inspirations and who I admire. Rather than list off reems of published pros, I’ve decided to discuss the more “regular” people (If I can use such a word), with whom I share my love for photography. Mark – the taste was sort of close, but the Miette cookie texture was superior by a lot. Oh well… I think a slightly longer baking time might not hurt the cookie texture though – the cream cheese seems to keep it quite soft/tender. You worry too much! :) You’re a hoot with your tele terms. Here’s one: just huck it! Woolly – you know, you can try ice fishing :) It’s too bad I can’t figure out a way for everyone who reads the blog to acquire a sample of the recipe! Sarah – great! I hope you like it. Amanda – give it a try. I think the jam might behave itself. Mine didn’t seem to have too many problems and this was my first attempt! Mimi – well, it’s probably more fun to see the pictures for non-winter lovers than to live the pictures, right? :) Good luck with your cookies. Kevin – it’s not bad! WoRC – yes! I can totally teach you how to tele. I am the one who taught (and continues to teach) Jeremy to tele. I used to coach vball and have a pretty good grasp on analyzing form and technique. Come on out guys. There are mountains with your names on them! Denise – ah yes, these are great to send to people. Just beware of my gooey jam issues! 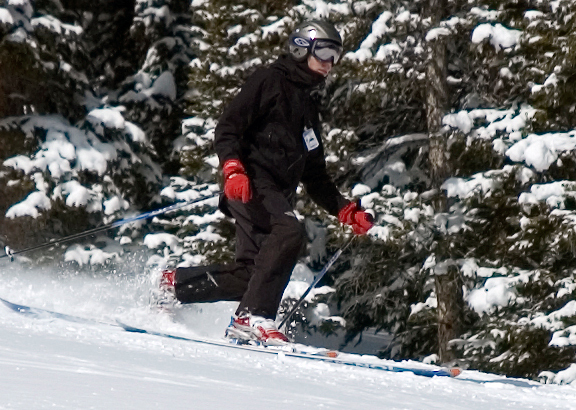 Chirstina – Colorado is snowy, but sunny – a very pleasant combination :) Cool! We have the same rice cakes! Patricia – they’re pretty good, and cute to boot! I am more than willing to pay for fed-ex to send me cookies… or anything else for that matter!!! can I just drop by spoon full. Helen – you could try. I’m anxious to make these so… quick question: no eggs? And if yes, the dough stayed together just fine? Diana – no eggs and yes, the dough was fine! Thanks a million for your quick response!